Brendan Tumwesigye came to race on Monday. With the State Meet just five days away, the Woburn High senior solidified his status as one of the contenders in the 400-meter hurdles at the Eastern Massachusetts Division 2 Championships. Tumsweigye clocked a state-leading time of 54.83 seconds. 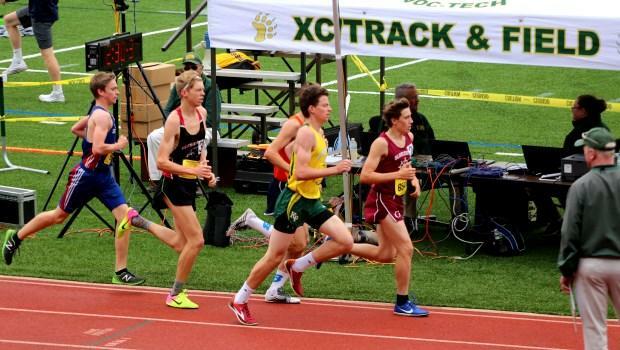 His time was a nearly two-second PR and about 10 meters ahead of runner-up Gregory Desrosiers of Central Catholic, who was timed in 55.47. Caitlyn Halloran took the girls' event with an all-time best of 1:03.54. Beverly's Shelby DeGenier secured second in 1:06.05. To no one's surprise, Arlington's Ryan Oosting dominated the distance events. Oosting began the day by capturing the two mile with a time of 9:23.93. Concord-Carlisle's Zander Kessler took runner-up honors in 9:31.06. The Spy Ponders' standout took the mile in 4:18.31. King Phillip sophomore Michael Griffin was second at 4:21.04. Phillip Magre of Somerville emerged victorious in a talented 400m race where he broke the tape in a PB of 48.50. Magre held off Belmont's Calvin Perkins, who also went sub 49 with a time of 48.74. Dejury Amado of host Greater New Bedford Voke was third in 49.39. Beverly's India Ingemi clocked a state No. 2 of 56.94 to take the girls' 400m. She was followed across the line by Billerica's Nicole Anderson (second, 58.46), West Roxbury's Jahphiah Gilliard (third, 58.54) and Plymouth North's Caitlin Haley (fourth, 58.92). In the team competition, Sharon captured the girls' title, defeating second-place Beverly, 92-57. Woburn took home the hardware for boys, 91.5-69, over runner-up Central Catholic.